The John Barron Auditorium is the site for many community and private functions. With a full service kitchen and large stage it makes for a perfect place for weddings, banquets, festivals and other community events. It is also home to TMSS Tornado school activities. 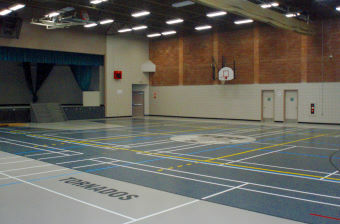 With its sport court flooring it is soft enough to dive on but still doubles as a great dance floor. For more information contact the Recreation and Parks department. For rates please see the Fees and Charges page. North East Heath Center Inc.